Owner, Lonny Gordon’s first car was a ’67 Camaro and he never looked back. He knew his future would always involve muscle cars in some way. He went into business in 1991 specializing in auto detailing, with muscle cars being only a small portion of his original venture. The business continued to grow and change as more and more clients learned of Lonny’s unique talents. Soon he was able to focus entirely on muscle cars and quickly realized he’d outgrown the Wrightsville facility. 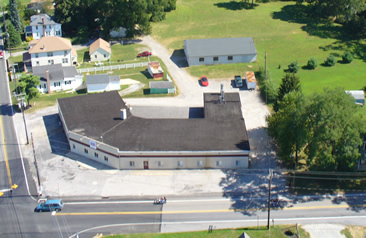 In 2006 a dream came true when he moved into the new 14,000 square foot facility located in Craley, Pa. The building has a long and interesting history, as it was originally built in 1917. A fire leveled the county landmark, H.C. Frey garage, automobile showroom and farm equipment store in 1957. The blaze destroyed new cars, as well as a 1950 model car and a 1918 Ford Model A, along with farm tractors, mowers and corn cutters. Lonny was excited to restore the building back to its original intent, meanwhile gaining a lot of interest from the community. Our Open House was held on Saturday August 5th, 2006 from 10 am to 4 pm. Attendance topped 500 people on a gorgeous day. Thirteen complete shop cars were on display in the front of the building. Seven project cars in the fabrication and body shop. The assembly room displayed four cars that wow'd our audience. Over lunch hours grilled hotdogs were served by the local fire company. A donation was collected in memory of a local auto mechanic who recently passed away. ©East Coast Muscle Cars. All Rights Reserved.